The umbrella is thousands of years old. Which means thousands of years of people cursing in frustration and throwing their umbrellas in the trash in disgust when they flip inside out or rip apart in the wind. Now it looks like someone's finally come up with an umbrella that not only survives a strong breeze, but delights in it. The Senz Umbrella has an asymetrical airfoil shape that causes it to automatically lean into the wind, instead of flipping backwards when hit with a gust. They're available in Europe, and in the US via the Totes website. 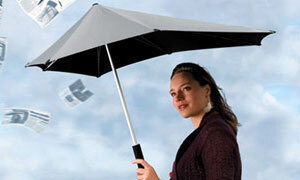 They ain't cheap (about $55) but it may just be the last umbrella you ever buy.